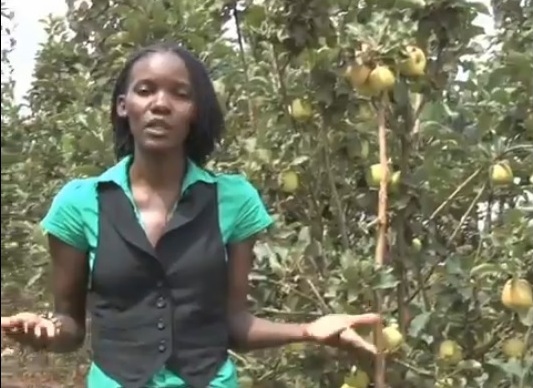 I found a YouTube video shot July of 2013 at the Mukono Zonal Agricultural Research and Development Institute (MUZARDI) detailing their field trials with apples. This station is at a lower altitude (3,500 ft.) just north of the equator and is a truly tropic climate, with little difference in seasonal temperatures or daylight length. The enthusiastic Technical Person Grace Bazanya describes the trees and gives a good overview of what growing apples in the tropics consists of. The presenter Florence Naluyimba states what we’ve been saying for years, that “Researchers have proven that apples can grow in just about any sort of environment as long as they are properly managed and you don’t have to say anymore that the weather is a limiting factor in growing apples in Uganda”. Well said, Florence, we completely agree with you.